Tuesday, June 6th, 1939 – the Brooklyn Dodgers, under new player-manager Leo Durocher, beat the Pirates 5-2 at Ebbets Field behind a complete-game victory by Freddie Fitzsimmons, and after years of languishing in the “second division” of the National League (which would be 5th to 8th, or last, place in those days), jumped from 5th to 3rd place to find themselves legitimately in the “first division” for the first time in many seasons. Willard Mullin, the sports cartoonist for the New York World-Telegram, was so inspired by the occasion as to finally create the first illustration of a character he’d been working on, based on Emmett Kelly, the famous “hobo” clown, and related to a passing comment he’d heard from a Brooklyn cabbie after leaving a Dodgers game one night. Regular visitors to this blog will note that most of these posts are based on the best baseball photography of days gone by, and then revealing the story behind those photos, be it an action shot of a bang-bang play at the plate, or a carefully crafted portrait. However, as photographs in print were still somewhat limited, it was often the cartoonists or illustrators of the era that would tell the story, many simply works of art in their own right. So, to include these in our ongoing celebration of classic baseball, we’re introducing a new category, “Art of the Game”, showcasing the finest in baseball cartoons, advertisements and ephemera that were as much of a part of the enjoyment of the sport as anything else, and Willard Mullin’s Brooklyn “Bum” debut is our worthy first installment. Anyway, the passing comment, noted earlier, was either from 1937 or 1938 depending on the source; Mullin himself told the Sporting News in 1949 (below) that it was in 1937, after Mullin watched Brooklyn split a doubleheader with the Giants that resulted in the Dodgers moving into 4th after a Game 1 win, only to drop back into 5th after dropping the nightcap. Great story, but it never happened; there is no occasion that the Dodgers split a DH with New York under that scenario in the late 1930’s at all. Later quotes and sources pinpoint it to 1938, after Johnny Vander Meer shut out the Dodgers for his second consecutive no-hitter, which happened to be the first night game at Ebbets Field. 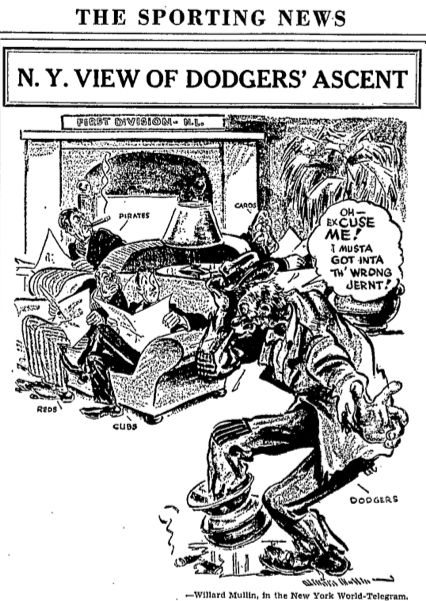 The second division/first division situation, however, did occur in June 1939 (and matching the teams in the cartoon) as discussed above. Either way, the origin is mostly lost to history, but the conversation is not – Mullin left the stadium and hailed a cab, and the cabbie asked a simple question, “How did our bums do today?” As Mullin said in his autobiography, he was particularly struck by him saying “our bums” instead of “the bums”, and he envisoned a character with a combination of warmth, ignorance and arrogance that would have great appeal to Brooklyn fans. 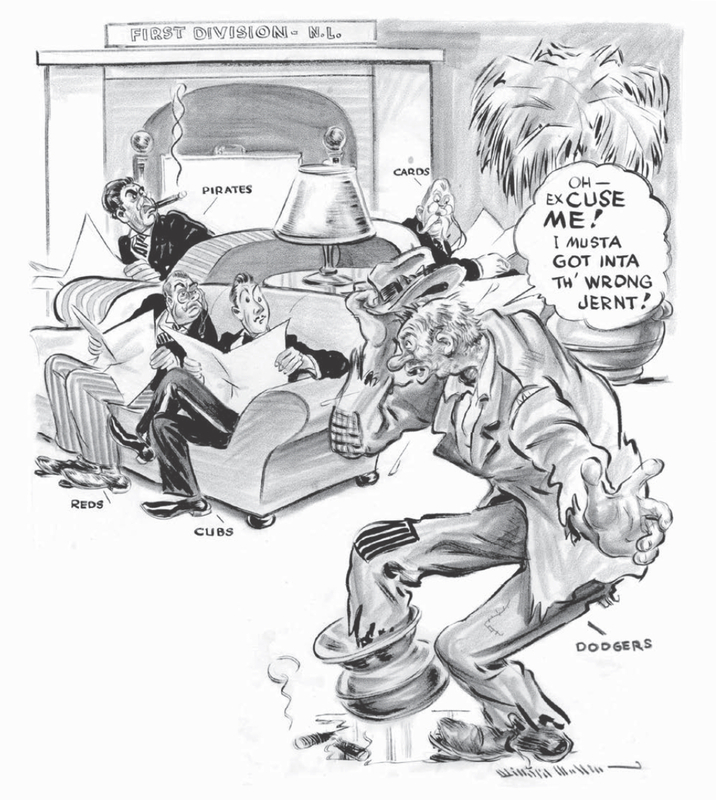 The cartoon first appeared in the New York World-Telegram soon after the June 6th contest, and then the Sporting News, who regularly featured Willard Mullin’s work, published it with the caption above in their June 15, 1939 issue. 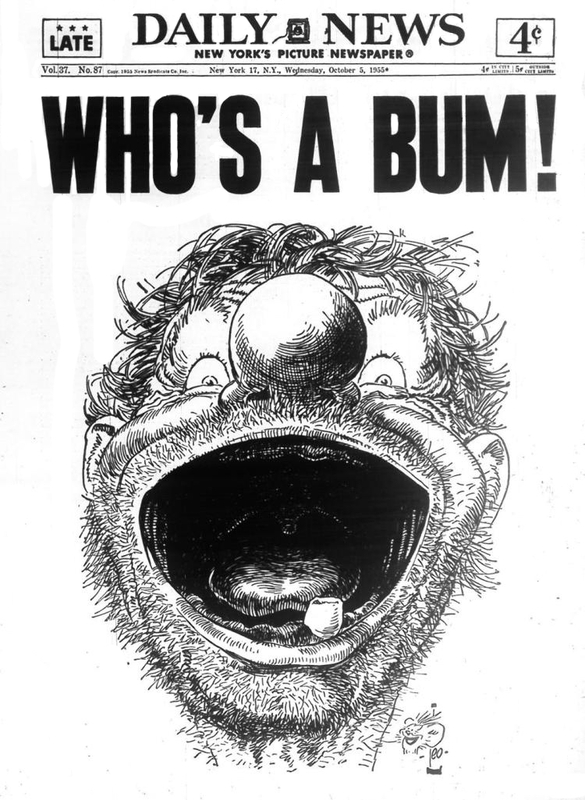 Mullin’s creation was immediately embraced by the faithful, and remained popular throughout their remaining tenure in Brooklyn (who can forget fellow cartoonist Leo O’Mealia of the New York Daily News co-opting the “Bum” for their legendary late edition front page below after they finally won the World Series in 1955). In the Bum’s debut, he stumbles into a pretty pretentious party, and maybe justified – after enjoying exactly one day in the “first division”, the Dodgers lost to fall right back into 5th place. However, Durocher’s newly christened “Bums” would not be held down for long, and were soon a regular, even well-respected member of this exclusive club, finishing third in 1939, and, except for a wartime hiccup in 1944, finished in the first division in all their remaining years in Brooklyn. 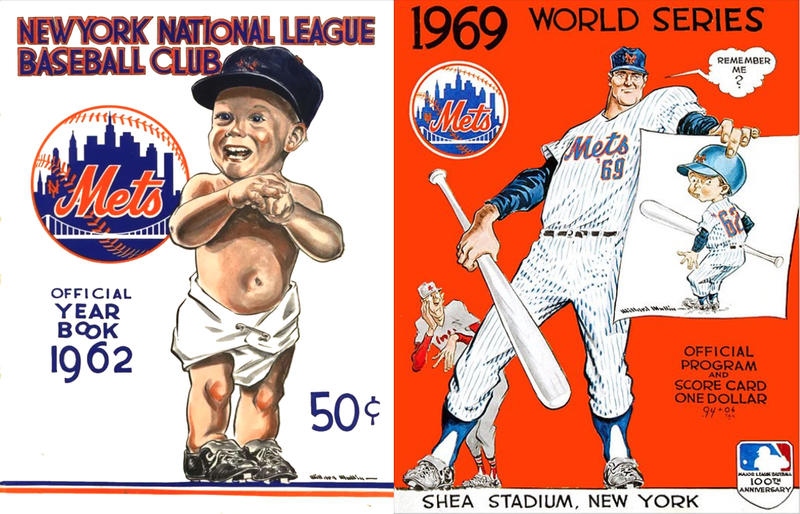 Willard Mullin’s “Bum” is his most well-known creation, but today he is widely considered one of the finest baseball (and sports) cartoonists of the 20th century, also creating a character for the New York Giants (yes, a literal giant, which will be featured here in a future post), and especially illustrating the iconic New York Mets Yearbook and World Series covers of the 1960’s, in their evolution from a toddler in 1962 to a muscular, menacing figure in 1969 (below); his work has always represented, better than most, true “art” of the game. Another winner, Tom! And your description of Willard Mullin’s Brooklyn “Bum”–a combination of warmth, ignorance and arrogance–is perfect. When he wandered into the exclusive First Division club and exclaimed “I musta got inta th’ wrong jernt” did it not remind you of the brilliant Art Carney as Ed Norton? Also, your reference to Johnny “Double No-Hit” Vander Meer in 1938, completing his second consecutive no-hitter against the Dodgers reminds me of another famous pitcher who almost duplicated the feat nine years later. After hurling a no-no against the Braves on June 18, 1947, Cincinnati’s Ewell “The Whip” Blackwell got 25 outs against the Dodgers in his next start on June 22. But Eddie Stanky, with one out in the ninth, bounced a chopper between his legs to break up Blackwell’s bid for a second consecutive no-hitter. Jackie Robinson then followed with a line drive single into left center and “The Whip” had to settle for a measly two-hit shutout. At 6′ 6″, Blackwell was a giant in those days and, particularly against right handed batters, was almost impossible to hit in 1947. With his buggy whip side-arm motion he was once described as “Looking like a man falling out of a tree,” But the violent herky-jerk motion was tough on Blackwell’s frail physique and his short career was riddled with assorted injuries.